Greetings, all! It’s your friendly neighborhood, fanged Taconian! 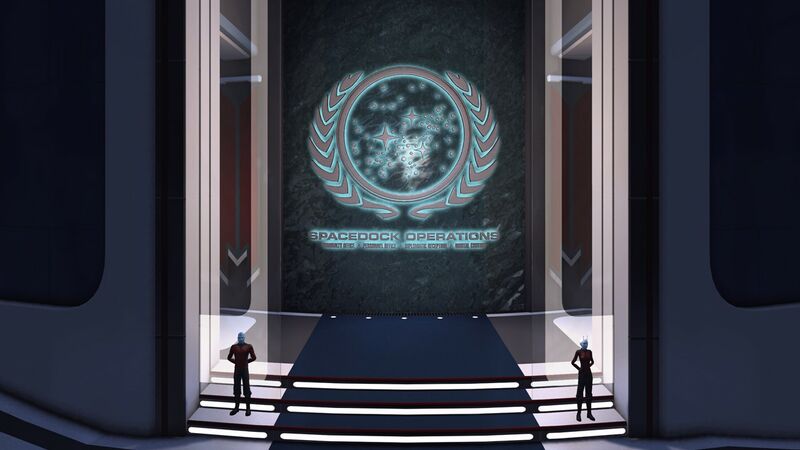 Let’s talk about Earth Spacedock, shall we? 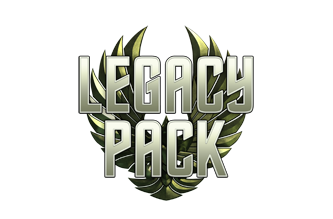 Many of you know that we’ve wanted to rebuild ESD for a while now. Our current Earth Spacedock has served us well, but it’s lacking in certain features and is starting to show its age. Luckily, we dedicated a chunk of time recently to finally rebuild ESD. We started the process in mid-December, 2013. Initially, we weren’t sure what the right direction was for ESD, so we started with some fundamental questions. How big should it be? Where on the station should players be? Could/should it all be on one level or should it be split up? Everyone on the team had a different idea in their heads, and it was my job to try and reconcile all of them and come up with something that everyone was ok with. 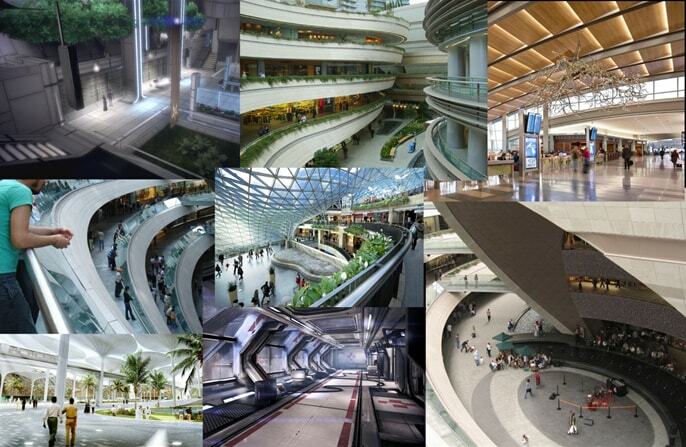 There was a significant amount of deliberation over certain points of the overall design. How many floors it should be was probably the main sticking point. Before building anything, I started on paper (…well, Photoshop). 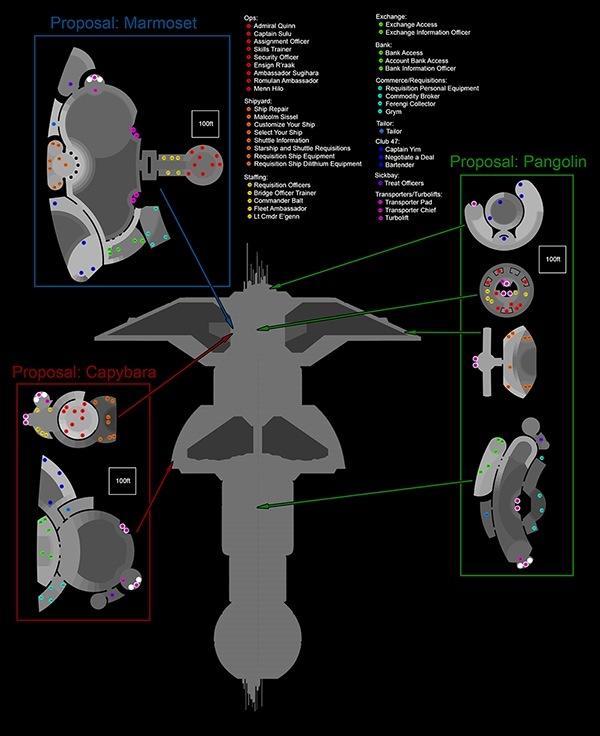 Three of the initial proposals drawn up in Photoshop. As you can see, we looked at and tried a few different approaches. We tried keeping it all on one level, breaking it into two levels, and breaking it into multiple levels. It was very important to me that the new ESD felt like it was in an actual section of the station, which is something the current ESD lacks. Each of these designs was tagged as being at a specific point of the station. We quickly found that hand-drawn maps just weren’t cutting it for figuring out the play spaces, and so we started modeling some options. 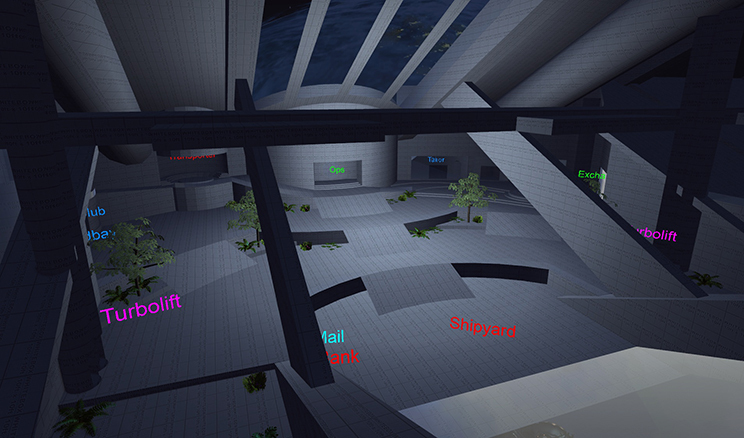 From the maps, people liked the Shipyard/Ops section of Capybara, but the concourse area of Pangolin. We then combined various ideas to make a few rough Whiteboxes. 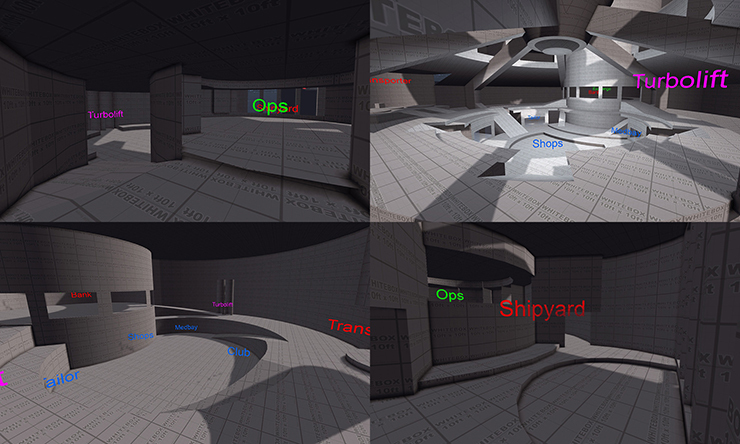 Screenshots of different early Whitebox tests. A Whitebox is what we call a very early, rough map that is usually made out of very simple geometry, with no textures. (i.e. White Boxes). Whiteboxes are great for figuring out a space before you start putting a lot of time and effort into it. However, since they lack props and textures, it is often very hard to judge sizes/distances accurately. We use the “Whitebox 10ft x 10ft” texture to help show off the size and in this case, we made name cards for the various locations to make it more apparent where we intended to put everything. After a few very rough tests, everyone wanted to see something more fleshed out, so I took our most popular design elements and built from those. 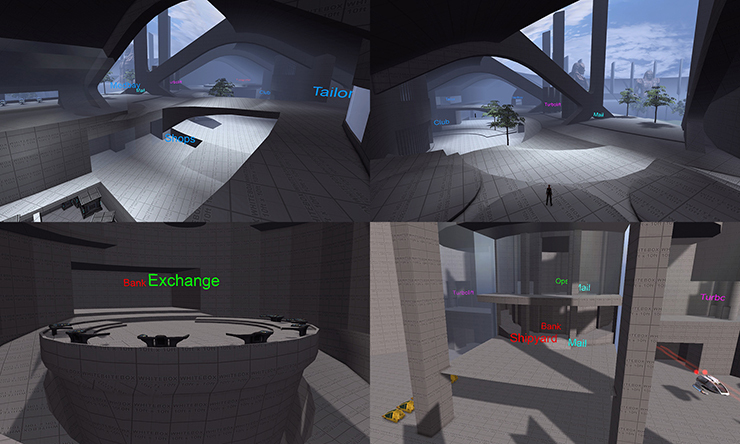 Some shots of the later, refined Whitebox test. This iteration of the concourse led to a lot of discussion, as people had very strong feelings on what was done, what was included, what was left out, etc. The holographic sky, the multiple floors, and the prominence of the club didn’t fit with what most people thought Earth Spacedock should be. There was a discussion on what we really wanted to get out of the design, and we came up with a list of what everyone thought was important. After this meeting, a few solid points were decided. 1) It was all going to be on one floor. 2) We had to have a view both of Earth AND of the Shipyard. Point two meant that there was only one place for it. It had to be within the outer wall of the docking bay. With all of these new decisions in mind, I went to work on a final Whitebox layout. Linear thinking made us want to lay things out in an arc to follow the curve of the dome, but we wanted to make sure that everything was visible. That portion of the docking bay also has a very steep slope to it (25°). That made it difficult to build a standard, vertical walled structure within it. We wanted to make sure that you felt like you were actually within the station, so we decided for a more open space, with the structure of the station exposed. Eventually, after some discussions amongst the art team, we ended up with the current layout on Tribble. The Whitebox was finalized and approved at the end of January. Since I was the one building all of this up until this point, I had a clear vision of it in my head. I knew what I wanted things to look like in the end. I could visualize it. However, going forward, I was going to need help building it all. Despite the immense talents of my coworkers, none of them (to my knowledge) are mind readers. So it was important than I dump all of that vision out of my brain and onto paper so that we could all be on the same page. As such, I spent the next week or so developing the ESD Environment Pitch Document. This is a long document enumerating everything I could think of about the design. This includes colors, materials, lighting, references, inspiration, NPCs, props, division of labor, etc. My co-creators, Peter Richmond, and Adam Flores, started a short time later (mid-February). Luckily, I had already made headway and was able to create some of the basic materials/textures that were going to be used in multiple places. I was also able to set up files for each area to help us all work together without stepping on one another’s toes. Once they started work, we were each responsible for different areas. I took care of Ops, the Concourse, the Docking Bay, and the exterior. Peter dealt with the Exchange, the Shops (Tailor/Requisitions/Commodities), and the Shuttle Bay. Adam did the Infirmary and Shipyard. A screenshot part way through development. While we each had our own sections, we sit next to each other. We talked, asked questions, gave feedback, and stole ideas from one another constantly. It was not long after Peter and Adam joined me that ESD went to Tribble. Those of you who were there at ESD’s Tribble launch saw some of those early Whitebox textures that had lingered around. You have seen the whole place as it’s become more refined over the past few weeks. Rather than go into detail on actual asset creation, I’ll just show you some time-lapse images I made of Earth Spacedock’s rise from the final, approved Whitebox on January 29, to its pretty-much-done state as of a few days ago. Not everything ends up following the plan. As we make stuff, certain things don’t work, or they need to be changed for one reason or another. All of the preproduction time we used was vitally important. It made sure we all had the same vision. Making and throwing away Whiteboxes may seem like wasted work, but each of those iterations taught us valuable lessons that we would not have learned otherwise. I am confident that if we’d gone through to the end based off of that first whitebox, ESD would not be nearly as functional or cool as it turned out to be. I’m really looking forward to the new ESD going live. It’s great when you get to see one of your dreams come to fruition. Thanks for joining me in this walk down redesign lane. I hope you enjoyed your visit.